You may recall head of human resources at An Garda Siochana John Barrett. 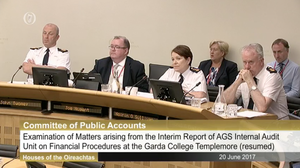 He was the civilian member of the guards who told Garda Commissioner Noirin O’Sullivan about the financial irregularities at the Garda College in Templemore, Co Tipperary on July 27, 2015. This is the date Ms O’Sullivan told the PAC, on May 4, that she first heard of the irregularities. Mr Barrett claims they, and others, discussed the matters for more than two hours. 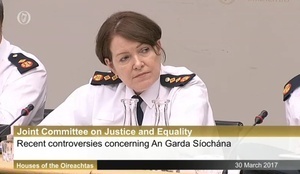 Ms O’Sullivan said they were discussed over a “very brief” meeting while having tea. 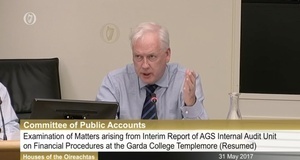 You may also recall how, in his notes, of the July 2015 meeting, Mr Barrett maintains he was “counselled to be very careful” when he “referred to the loss of all books of account prior to a date which coincided with the retirement of a restaurant manager”. 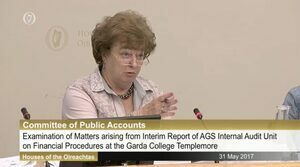 In September 2015, Mr Barrett urged Ms O’Sullivan to inform the Minister for Justice Frances Fitzgerald and the Comptroller and Auditor General (C&AG) of his concerns about Templemore but Ms Fitzgerald wasn’t informed until some weeks later. 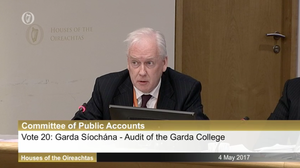 Several civilian members of An Garda Siochana are before the Public Accounts Committee today. 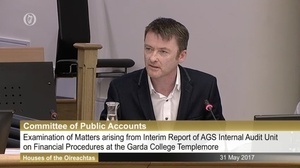 Mr Kelly, who was the author of Garda College interim audit report on serious financial irregularities at the Garda College, was the only person to give an opening statement to the Public Accounts Committee. 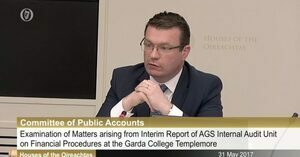 Readers should note documentation sent to the Public Accounts Committee, ahead of today’s meeting, includes a letter which was sent from the executive director of finance Michael Culhane to Noirin O’Sullivan on October 25, 2015, urging her to investigate Mr Barrett. John Barrett: “I have asked three times myself personally, four times through my solicitor to have the document that has just been referred to, that was released to your committee [PAC] yesterday, given to me. 85% of the document, that eventually was released under Freedom of Information – consider how this might play – was redacted in protection of the very issues that the Finance Director has now discussed. That reflects the situation in its reality. “And his correspondence was made available to your committee, I think it’s important that you have it. I discovered the existence of that letter almost a year to the day after it had been written. I think it is appalling that such information and the interesting inversion of trust that was presented to you, appalls me. 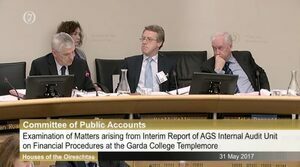 Posted in Misc and tagged Garda college, John Barrett, Michael Culhane, Niall Kelly, Noirin O'Sullivan, PAC at 1:08 pm on May 31, 2017 by Broadsheet. 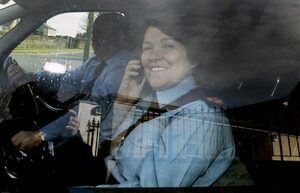 Perhaps she used one of those phones for cash services! Yet again, thank you PAC. It’d also be great if more institutions of government were as transparent and could be shown to be acting in the public interest. Where I work we’re in fear of internal and external auditors and no one dares try influence them. The Guards just don’t see themselves as a body where the normal rules apply. were in the same boat, for about 4weeks every year we have external auditors crawling up our bottoms looking at stuff, along with internal audit issuing orders and reviews, one year we actually had 3 sets of external auditors. you mess with the external auditors your gonna get fired in our place, yet you have this carry one with the guards and those charity lads spending cash on cars and holidays. Mr John Barrett should be invited into the class rooms of every Human Resources undergraduate course to give the next generation of HR Leaders a master class on the importance of proper note taking and record keeping in HR investigations. all smiles isn’t she. did she find her phone..
“perfect”…what a contemptible fupping wagon. Let’s destroy a man’s life with lies.. “perfect” the response from noirin. didnt work out so perfect though.